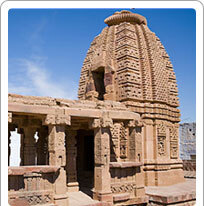 Osian is a cluster of ancient Hindu and Jain temples, dating back to 8th century onwards. Sun temple is notable for being the oldest. Sun or Surya is worshipped by the Vaishnavites who ruled here before people started converting to Jainism. Apart from historical and architectural value, the temple also attracts a large number of people for its religious (pilgrimage) importance. It has a beautifully carved doorway that is regarded as among the finest in India. lan for safaris can be followed.